Once again there was a very good turnout for the Webb’s AC match spread across the Two Island Pool and Wagtail Lake at Float Fish Farm Fishery on Sunday. Top rod on Wagtail was Vince Hull with 60lb on peg 21 fishing the feeder and pole short with pellet and sweetcorn. Next on this lake was Peter Harrison on peg 20 fishing a small Method feeder for 38lb. Leading the way over on Two Island from peg 24 was Phil Jones, who caught on cat meat close in for 77lb. Then came Marcus Webb with 67lb 5oz from 28, all taken on the feeder with pellet. 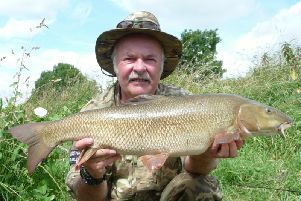 In the Monday open match on Float Fish Farm, Vince Hull made it two wins in as many days taking the honours from peg 11 on the Wagtail Pool with 78lb 4oz. Runner-up was Danny Carlton with 71lb 4oz. On the Two Island, Kevin Peacock was out in front with 118lb from peg seven followed by Tony Hudson on peg 23 with 75lb 13oz. Buttonhole Qualifier: 1 Liam Wagg 111lb 11oz; 2 Will Evans 73lb 4oz; 3 Steve Pell 71lb 9oz. Castaways AC, Biggin Lake: 1 Alan Jopling 25lb; 2 Mel Saggers 20lb; 3 Mike Mohan 19lb. Tuesday Club, Stretton Lake: 1 Mike Smith 9lb 6oz; 2= Alan Jopling and Mike Mohan both 8lb 6oz.